Hybrid bearings, i.e., bearings with steel rings and bearing grade silicon nitride (Si3N4) rolling elements, have been increasingly used in applications operating in challenging environments [1-4] such as high-speed, oil-free air conditioning and refrigeration compressors, general fluid machinery, electrical machinery and gearboxes. In some of these applications, both the boundary or mixed lubrication regime and solid particle contamination influence the bearing performance. In the case of a boundary or mixed lubrication regime, the bearing raceway surfaces can become susceptible to early surface distress and surface-initiated fatigue cracks, depending on the operating conditions, as well as the boundary friction-coefficient and wear behaviour acting on the contacting surfaces [5,6]. The failure risk on the raceway surfaces follows fatigue damage accumulation. In the case of a contaminated environment, solid particles entrapped in the rolling contact create dents with raised edges that can break through the lubrication film, even if the bearing operates in good full-film conditions. These larger but local surface dents lead to early surface-fatigue [7,8]. 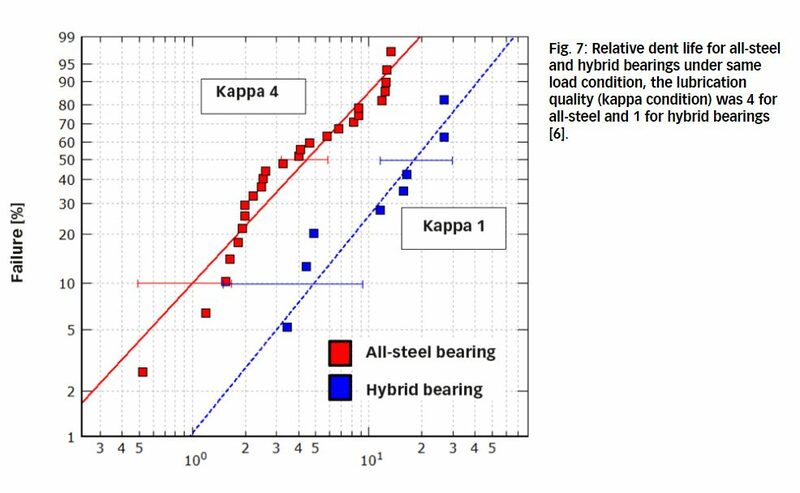 Dedicated experiments and modelling results are shown here to compare the physical mechanisms and performance of hybrid bearings with all-steel bearings for typical bearing surfaces in thin-film conditions in the first instance, and for larger denting features in the second instance. 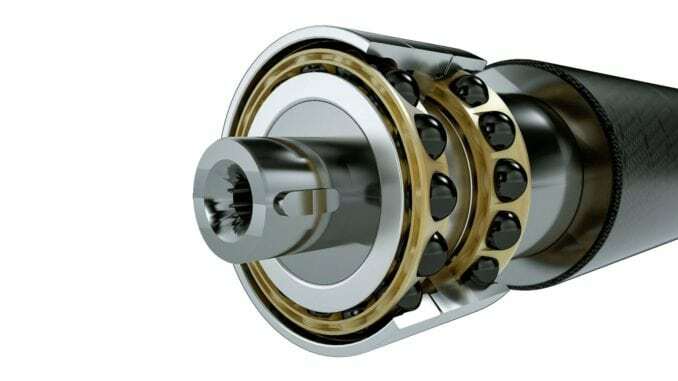 The experimental evidence shows that prominent performance benefits can be obtained by using hybrid bearings under boundary or mixed lubrication [1-4], including enhanced surface distress performance . 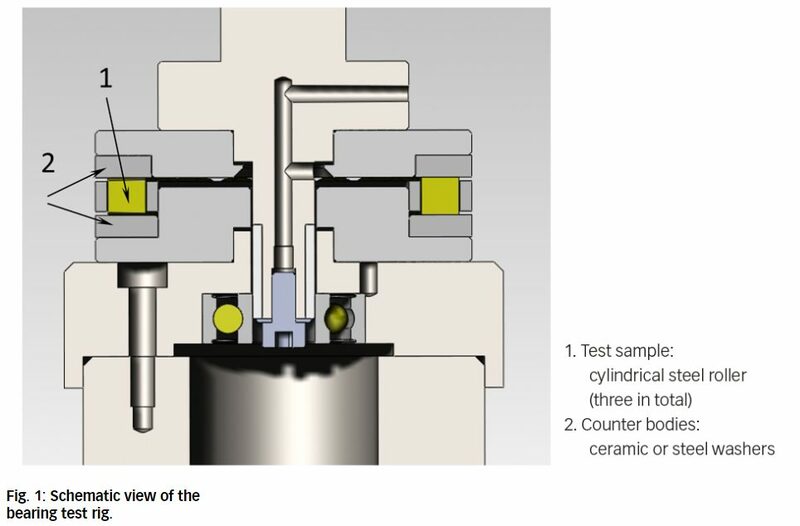 The performance of hybrid rolling contacts in poor lubrication  is examined in detail by means of rolling bearing fatigue experiments and a combined surface distress and wear model (described in ). 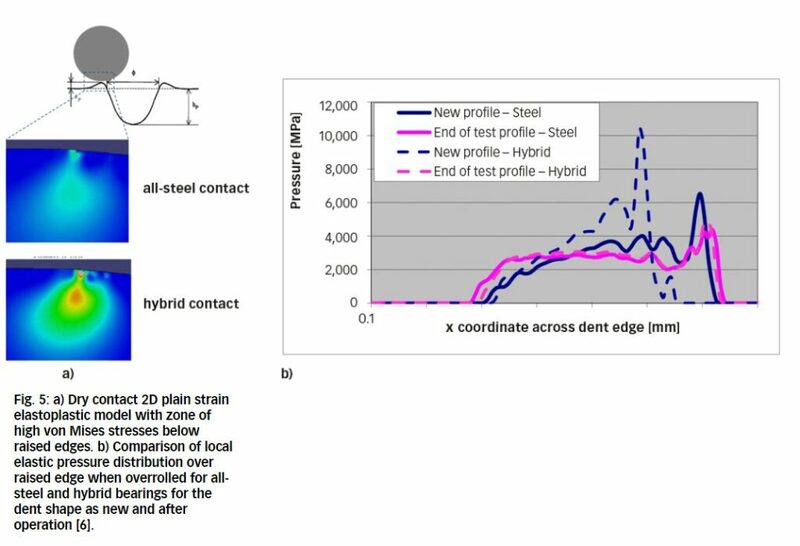 The research has also found that the large improvement in surface-fatigue ­resistance of hybrid contacts cannot be explained solely by normal differences in some of the roughness parameters existing between the all-steel and the hybrid contacts. It is necessary to take into account a considerable reduction (by a factor of two) in the effective boundary friction-coefficient of the hybrid contact, in comparison with an all-steel one, observed in dedicated tests . The tests were performed on a vertical friction rig (fig. 1) under testing conditions listed in table 1, using cylindrical roller thrust bearings with steel rollers (having higher cycling and quicker surface distress development than the washers) and steel or Si3N4 washers to represent the all-steel or hybrid contact configuration. To avoid wear during the test by using a too-rough ceramic flat washer, a polished surface was used. This is acceptable as the typical surface roughness of ceramic rolling elem­ents in a hybrid bearing is very low. The difference in surface roughness between the steel and ceramic washer was taken into account in the numerical simulations. Four tests for the steel contact and four tests for the hybrid contact were performed for a total of six hours (with intermediate stops at two and four hours). Optical profilo­meter (WYKO) measurements on the tested rollers were taken and software developed in-house was applied to quantify the surface-distress area. Due to the absence of clear surface damage of the steel roller in the hybrid contact within the six hours of test time, longer tests for a period of 97 hours (with intermediate stops at 37 and 60 hours) were also performed. 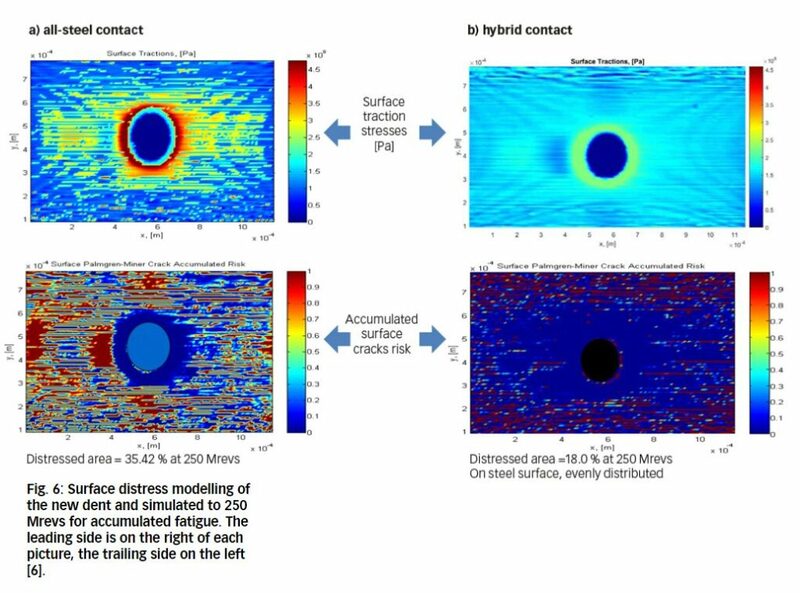 The main result of the correl­ation between the measurements and the numerical simulation (using the fatigue-based model  and combined fatigue-wear model ) of the surface-distress area for hybrid and all-steel contacts under the above-mentioned conditions is shown in fig. 2. One can easily observe a gradual accumulation of surface distress in time for the all-steel contact, while the hybrid one exhibits practically no surface distress. 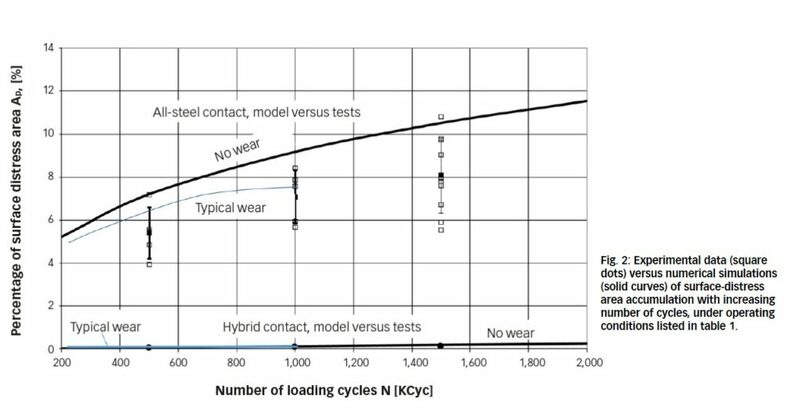 One can also see that the results of the combined surface distress/wear model with wear rates typical for hybrid contacts (blue curves) agree with the experimental data slightly better than the results of the model assuming no wear (black curves). The correlation between the numerical simulation and the measurements of micro-pitted area for hybrid and all-steel contacts suggests that on average there is a ratio of about 2 between the friction-coefficient of all-steel versus hybrid contacts, which partially explains the better surface distress performance of the latter. This average ratio was also obtained in previous experiments [7, 8]. Besides the lower boundary-lubrication friction, the other reasons for the better surface distress performance of hybrid contacts are the finer roughness and the more negative roughness skewness (i.e., deep valleys prevail over high peaks) of the Si3N4 counter bodies, in comparison with all-steel ones. Although much work has been performed for all-steel bearings, a major complication in studying mechanisms of damage progression and surface-fatigue related to dents is the random nature of denting. Controlling the number, the geometry and the location of the dents is challenging. This is why many studies have introduced artificial dents. These dents, produced by means of a Rockwell ball indenter on bearing raceways, have been used to study fatigue life reduction and damage process under rolling/sliding conditions for all-steel bearings. Spall initiation at the trailing edges of a dent relative to the rolling direction was observed. More slip or high-surface frictional traction would promote faster surface cracks initiation. The cracks are driven by maximum orthogonal shear stresses developed at the near surface of the trailing edges [7, 8]. The magnitude of these stresses depends on the dent geometries, the lubrication quality, the nominal contact pressure and the rolling/sliding magnitude. In addition, lubricating film collapse was modelled at the leading edge of the dent with wear and other surface damage. Little work has been published about performance of hybrid bearings in a contaminated environment. Pion­eering work  has shown excellent wear-resistance performance under heavily contaminated oil lubrication conditions. 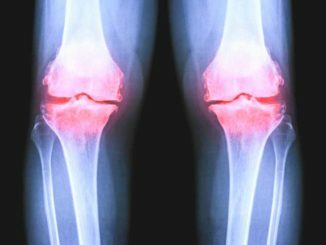 A “self-healing” mechan­ism related to the higher Young’s modulus and hardness of the Si3N4 was proposed. It produced plastic deformation of raised edges from dents on the steel counterpart, thus inhibiting surface distress, spalling and destructive wear. For more clarification and quantification, a direct comparison of performance was studied through experiments and modelling of artificial dents on the steel raceway when overrolled by steel or Si3N4 rolling elements . Such dents were created on the inner ring of all-steel and hybrid deep groove ball bearings (fig. 3). 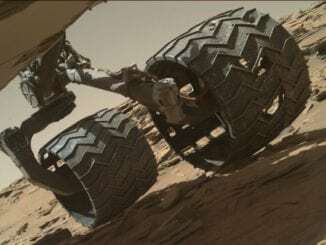 The ­bearings were then tested under equal operating conditions. The example shown in fig. 4 was for an operating condition of very good lubrication (full film) and medium contact pressure. Considering the Young’s modulus of the Si3N4 balls, this means that the hybrid contact is operating with a slightly higher nominal contact pressure (e.g., table 1). Regular interruption of the tests for inspection and measurements showed a noticeable difference between the all-steel and hybrid bearings in the surface aspect and changes of the dent raised edges (fig. 4a). The all-steel bearing showed limited plastic deformation and dent shape change of the raised dent edges (fig. 4b). This limited reconforming maintains a certain level of local pressure distribution when the raised edge of the dent is overrolled (as shown in fig. 5b). In addition, the surfaces showed clear superficial damage. On the leading edges of the dent (fig. 4d), where film collapse is expected, two mechanisms were observed: some superficial adhesive wear and superficial plastic deformation by asperities micro-denting as the steel balls’ surface is also roughened when overrolling the dent. On the trailing edge of the dent, where higher stress concentration is expected, the all-steel bearing showed superficial plastic deformation by asperities, micro-denting the raised dent edges. With running time the material is deformed and pushed into the dent (fig. 4e), and a small surface crack is initiated and slowly propagates upon further operation. Surface distress modelling [6, 7] indicates a local ring of high surface traction stresses and distress (fig. 6a) and crack initiation risk corresponding to the specific location observed in the tests (fig. 4b and fig. 4e). At an early stage of operation the hybrid bearing developed larger and flatter dent edges (fig. 4a and fig. 4c). Mild wear erasing the finishing marks and maintaining a very smooth surface (fig. 4f) was observed on the leading edge from the very beginning. The Si3N4 ball surface also remained in good condition and maintained its initial roughness. The earlier shakedown (plastic stabilization) with material pushed into the dent was explained with elastoplastic finite element simulation (fig. 5a) showing higher stress and therefore higher local deformation for the hybrid contact. With further running time, mild wear (fig. 4g) was also observed on the trailing edge. This fast mild wear reconforming the dent edges and changing their slopes (fig. 4a) stabilizes over running time, and the dent shape no longer evolves. The pressures are sufficiently reduced to stop the mild wear mechanism. Although the local pressures were higher for the hybrid bearing to start with, the reconforming of the dent shape reduced the local pressure to a similar level as the all-steel bearing (fig. 5b) for this test condition. In addition to this reduction of local pressure, surface distress modelling [9, 10] indicated a reduction of pressure gradient at the dent edges. More importantly, and especially for the local dent edge thin lubricating film condition, surface distress modelling indicates lower surface traction stresses and lower fatigue accumulation or crack initiation risk (fig. 6b). This is due to the lower boundary friction-coefficient in the hybrid contact . A dent life was determined under equal load conditions for all-steel and hybrid bearings (fig. 3). The hybrid bearing operating at higher maximum contact pressure and thinner film condition still gave a better dent life than the all-steel bearing operating at lower max­imum contact pressure in full film (fig. 7). These findings can be seen as counterintuitive, but they illustrate the benefits of hybrid bearings when poor lubrication and surface asperities and frictional stresses are experienced, whether they are from denting or general poor lubrication. The presented mechanisms will compensate for eventual deeper dent created in the hybrid contact during particle entrapment and ­overrolling that have been reported for pure rolling conditions . These bene­fits greatly balance the higher contact pressure experienced in hybrid contacts over a certain range of loading conditions. However, for rare cases of application at very high contact pressures this positive balance may be jeopardized or reduced. Hybrid bearings are much less prone to surface distress than all-steel ones due to the reduced boundary friction and favourable roughness topography of bearing grade silicon nitride. In a hybrid bearing, only the steel counterpart undergoes mild wear, while the ceramic component remains nearly unaltered. In contaminated conditions, mild wear, plastic deformation and maintaining of smooth surfaces on the dent edges in the hybrid bearing contribute to reducing local stresses. The good resistance to surface distress and boundary lubricated condition-related damage around the dent where the film collapses was shown to lead to longer dent life for hybrid bearings. ALL ARE WITH SKF ENGINEERING & RESEARCH CENTRE, NIEUWEGEIN, THE NETHERLANDS. Gabelli, A., Kahlman, L., “Bearings that heal themselves”, SKF Evolution No. 3 1999, pp. 26-28. 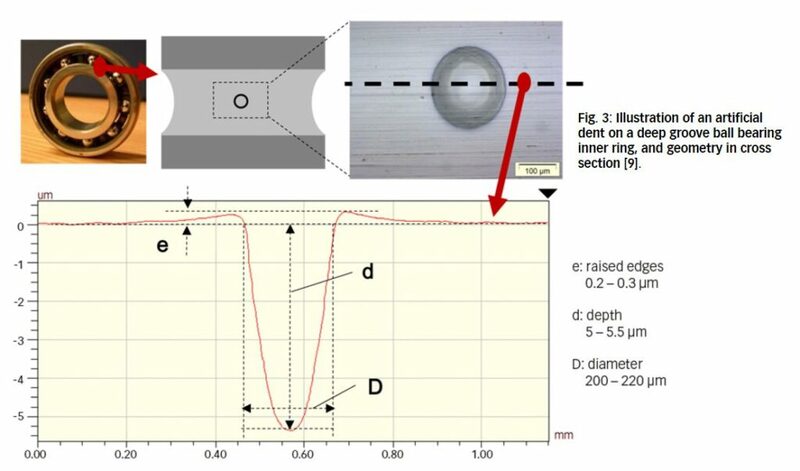 Morales-Espejel, G.E., and Brizmer, V. (2011), “Micropitting Modelling in Rolling-Sliding Contacts: Application to Rolling Bearings”, Tribol. Trans., 54(4), pp. 625-643. Brizmer, V., Gabelli, A., Vieillard, C., and Morales-Espejel, G.E. (2015), “An Experimental and Theoretical Study of Hybrid Bearing Micropitting Performance under Reduced Lubrication”, Tribology Transactions, 58, pp. 829-835. Morales-Espejel, G.E., Gabelli, A., “The behaviour of indentation marks in rolling-sliding elastohydrodynamically lubricated contacts”, Tribology Transactions, 54, pp. 589-606, 2011. 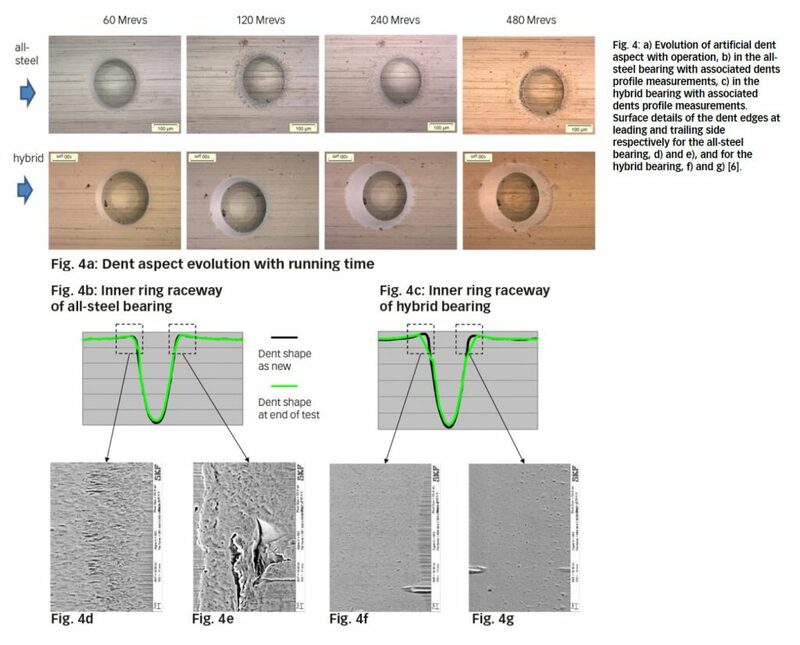 Morales-Espejel, G.E., Gabelli, A., “The progression of surface rolling contact fatigue damage of rolling bearing with artificial dents”, Tribology Transactions, 58, pp. 418-431, 2015. C. Vieillard, Y. Kadin, G.E. Morales-Espejel, A. Gabelli (2016), “An experimental and theoretical study of surface rolling contact fatigue damage progression in hybrid bearings with artificial dents”, Wear, pp. 364-365, pp. 211-223. V. Strubel, N. Fillot, F. Ville, J. Cavoret, P. Vergne, A. Mondelin, Y. Maheo., “Particle entrapment in hybrid lubricated point contacts”, Tribology Transactions 2016, VOL. 59, No. 4, pp. 768-779.